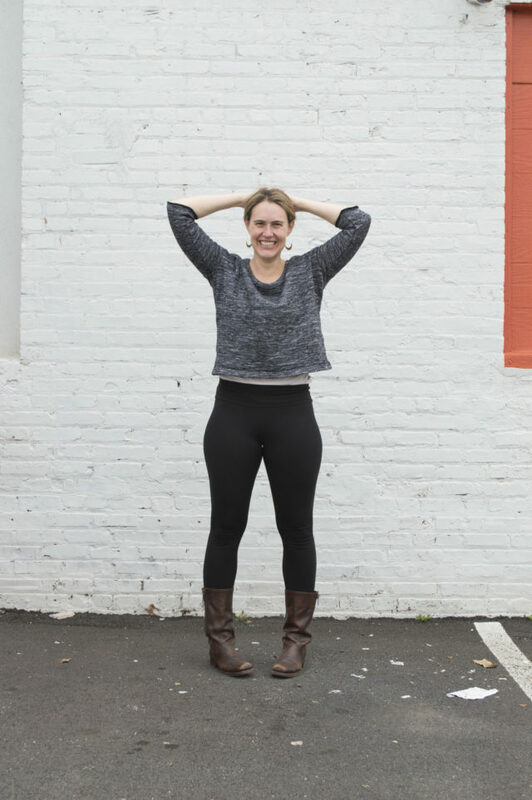 It’s no secret that I love the Sloan leggings from Hey June Handmade. They have a flat, wide waistband that keeps them comfortable and snug without the horrible digging-in of an elastic waist. (At this point in my life, I have had it with elastic waistbands on leggings. It’s never been comfortable and at the end of the day I have a deep gouge across my middle. Done. With. It.) I’ve said it before and I will say it again…these are the best leggings ever and the only leggings I want to wear. Plus, I mean, they are leggings. 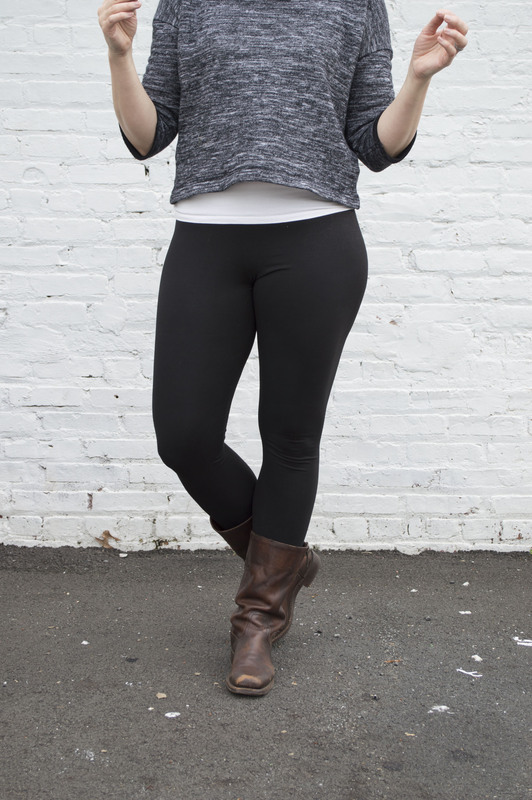 Leggings are such a handmade wardrobe staple. I can wear them with my tunics, my handmade dresses. They are the unsung heroes of the closet and I’m proud to sing their praises. So, imagine my delight when I discovered it was possible to make them even better. You have to understand, this is the fourth pair of sloan leggings I have made. I’ve also taught others how to make them. I’ve been into these leggings for a long time. But, you know what they say about cooking…it’s all about the ingredients. The same is true of sewing. In this case, the recipe improvement was finding the perfect fabric. It’s totally opaque and soft and perfect. It’s a double-brushed poly and rumor has it this is what Lularoe leggings are made out of. Who knows? I got mine at Imagine Gnats and I made these with my own two hands. Lularoe, Shularoe. By the way, it looks like Imagine Gnats is sold out of the black double-brushed poly. Bummer. But, they do have other gorgeous colors in stock. So here is the deal. This fabric takes the Sloan Leggings to a whole new level for a couple of reasons. Like I said, the fabric is completely opaque and when it comes to leggings this is pretty much essential. In the past I have used laguna knits with 4-way stretch and I love how stretchy it is but it isn’t completely opaque. When stretched the laguna knits are a tiny bit see-through. This makes me feel uncomfortable wearing anything that doesn’t fully cover my behind. 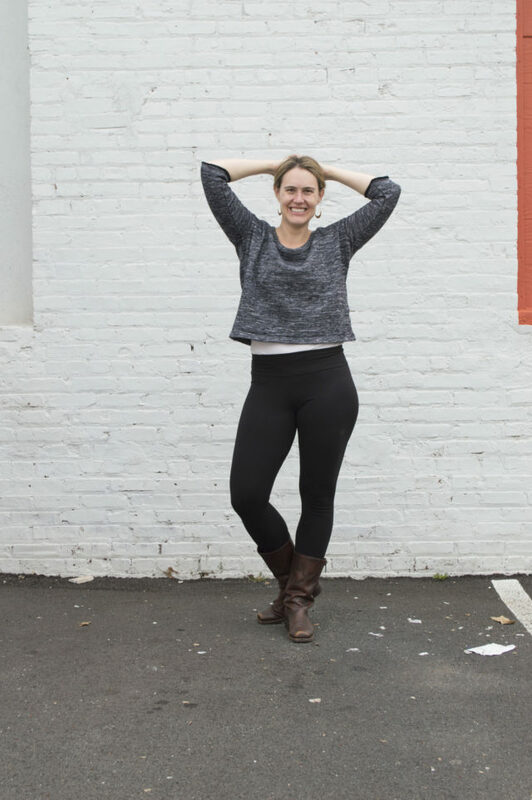 I don’t have to worry about that with the double-brushed poly fabric and that makes these legging so much more versatile. Secondly, calling this fabric soft is a huge understatement. It’s so soft it’s like wearing a hug. I honestly gasped when I put them on for the first time. So unbelievably soft, I never want to take them off. See. They are truly the best leggings ever. For anyone wondering about the nitty gritty, I made the leggings in a size M, but the waistband a size S and used black swimsuit material to line the waistband. This keeps them from slipping down and holds them in place just right. Note: This post contains affiliate links. If you make a purchase after linking to Hey June Handmade from this post, you will be supporting A Happy Stitch at no additional cost to you. Thanks! Have i ever mentioned that I so love your blog? It’s so inspiring and real. I read it all the time yet never give back. There, I need to say: thank you! You made me start sewing for myself, in stead of just for the smallies in my life. And now I’m off to make some leggings. Oh my goodness! This comment has made my year. I am so thrilled that you ventured into sewing for yourself and am touched that I had a small part in that decision. Thanks so much for your kind words. They really mean so much. Ooh, good review. I think there is a Sloan in my future. I’m having a hard time deciding between the Sloan and the Avery by Helens Closet.